Irmas role is to establish reliable methods for evaluation of frictional resistance of hull coatings as well as different stages of fouling through experimental works. Antifouling coatings are primarily used to deter the fouling on ship hulls. In general, the assumption regarding the hull roughness, which is mostly represented by coating types and conditions, materially influences the power required to drive the ship and it’s fuel consumption and hence the operational cost, GHG emissions. Therefore, continual development of coatings and different coating application practices require continuous updated estimates of roughness and skin friction data. 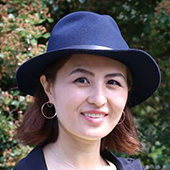 Before joining Chalmers University, Irma pursued her PhD at Newcastle University (U.K.). The PhD work focused on building a systematic data on roughness and hydrodynamic drag for commercial marine coatings with "in-service" surface conditions by using experimental methods. During her studies, she also worked on ongoing EU project "Seafront". There might be more projects where Irma Yeginbayeva participates, but you have to be logged in as a Chalmers employee to see them.